The story I’ve just laid out is an experience with the usability dilemma (I coined that phrase). If a website isn’t totally user-friendly, the viewer is much more likely to leave the site without pressing “order” or “call now.” Instead they’ll be more likely to order from a website that they can view and use on a mobile device with ease. 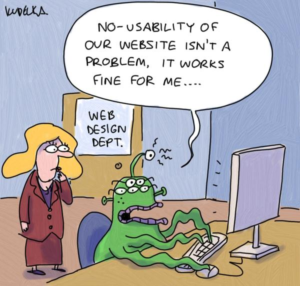 Don’t be the business that loses customers because your website’s usability isn’t up to date. Follow these practical steps to improve usability. First and foremost, a website should be accessible on all devices, from desktop computers to smartphones. As was mentioned before, people don’t want to have to pinch and scroll from left to right just so they can read the content on a website. They will most likely leave. Google has even taken notice of this. Back in April of 2015 they made changes to their algorithm saying they will increase the ranking of sites that are mobile-friendly. Besides being mobile-friendly, it’s also important to have quality content. Think of what a user would want. Would they want something confusing and difficult to navigate or understand? Of course not! Make it easy for viewers to know what to do. That means no keyword stuffing. That means leaving some blank space that helps draw the eye to valuable information. And that means easy-to-understand calls to action and organization. If viewers have trouble with the basic interaction on your page, they’re more likely to leave, and that’s never good for business. Sites with spammy and aggressive ads are often ranked poorly in search results. Use common sense. Make sure advertisements don’t overpower the website’s content or take up a majority of screen room. Do you have a slow web hosting service? A bunch of broken links and images? When users click on links in your site are they being sent to an empty page (101-errors)? Let your developer (or us!) check on any of these problems and errors. If you don’t, you’re only contributing to a poor user experience. Google thinks so too and will count these against you when considering your website in their algorithm. Thankfully these are easy to fix and will only benefit your ranking and your visitors. Take these simple and practical tips to heart and improve the usability of your website. Don’t lose customers because they leave your site too soon. Updating your website’s usability will improve your SEO strength and viewers will see you with more credibility. And they might even order some extra wontons.